This post contains the solution for a small problem we encountered when trying to produce an FSG report. When trying to produce an FSG report in ADI the other day we noticed a problem with the YTD-Actual column in the report. We wanted to print the report as at December 2005 (i.e. the last month of the year) so that we could see what the budget figures looked like. When trying to print the report in this fashion the YTD-Actual column for Dec 2005 was displaying zero values even though we knew there should be data in the report. We tried printing the report from within General Ledger but still the same result, zero values in the YTD-Actual Column. We knew that there should be values in this column as January and February had already been closed and most of the entries for March had been processed. Even when performing a drill down to the detail in the General Ledger we could see that there were values present. The problem was a simple one which we found the resolution for buried in point 30 of Metalink Note:108236.1 entitled FSG Functional FAQ. The solution suggested that in order for the YTD-Actual data to display in the report you should ensure that the GL periods upon which you were reporting should be open or closed. In our instance the periods from April to December were still Future Enterable and hence we resolved the problem by opening these periods and immediately closing them so that they now had a status of closed. Once this simple task had been performed we were able to see data in our report. This post highlights a profile option you need to be aware of when setting up AutoReversing journals. Oracle Apps gives you the ability to manually or automatically reverse posted journals into subsequent accounting periods. We set up AutoReversing journals at a client site the other day so that the journal would automatically reverse in the next non adjusting accounting period i.e. if you were in period 12 of a year it would not reverse the entry in period 13 (an adjustment period) but rather into the first period of the next year. A typical example of where you might want to do this is in the case of an accrual that you raise at the end of month which you now want to reverse in a subsequent month - see the diagram below. Having completed the setup our expectation was that the journal would reverse when opening the next month (which is the trigger that runs the Automatic Reversal Programme). To our surprise the journals didn’t automatically reverse in the next month, however, the solution was a simple one. 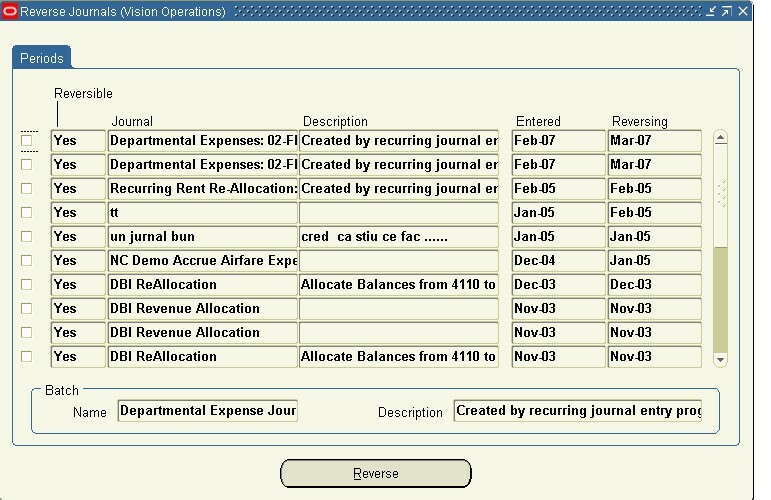 By setting the Profile option GL: Launch AutoReverse After Open Period to Yes we now found that when opening the next accounting period two concurrent requests were spawned, one to reverse the journal and another to post it (as enabled by selecting the AutoReverse and AutoPost Reversal options shown in the above diagram) . If you do forget to turn on this profile option as we did, you can still go and manually reverse the journal by choosing the following navigation path in General Ledger: Journals > Generate > Reversal. The result will be a list of journals which you can manually choose to reverse as shown in diagram below. I received an interesting error message when trying to perform a journal upload in ADI at a client site yesterday, here’s the solution to the problem. The validation that ADI uses for client side validation cannot dynamically create a new flexfield, only the server-side validation has been designed to dynamically create valid flex code-combinations - Bug:1924015. The simple solution to the problem is to set the Profile Option profile Flexfields: Validate on Server to Yes. It’s also important to note that Cross-validation checking is only performed if you have this option set to Yes. Another Metalink Note 251463.1 provides the same solution for the system allowing the upload of Disabled Accounting Flexfield segments to General Ledger via ADI. The other day I came across this feature in Financial Statement Generator which I never knew existed and found to be quite useful. FSG Transfer is a programme that you can run in General Ledger which gives you the ability to copy Financial Statement Generator (FSG) components from one environment to another. For example, you might want to transfer your FSG’s from a TEST environment to your PRODUCTION environment. You or your System Administrator must define database links. The Chart of Accounts in your source database must be identical to the Chart of Accounts in your target database. Any currencies and sets of books referred to by the row sets and column sets being copied must exist in the target database. Report details, such as budgets and encumbrance types, referred to by copied reports must exist in the target database. You must be logged in to General Ledger and connected to the target database. The name of the component selected above should be entered if you are copying a single component mentioned above. If you are copying all components you do not need to specify a name. The exact name of the Chart of Accounts from which you want to copy report objects. The exact name of the Chart of Accounts to which you want to copy report objects. The name of the source database from which you are copying. This field will not have a List of Values (LOV) unless you have defined database links. To define database links within the General Ledger Responsibility go to Setup > System > Database Links and create a New Database Link (if you have any uncertainty about what parameters to enter here contact your DBA, typically you should be able to extract the connect string from the TNSNAMES.ORA file).